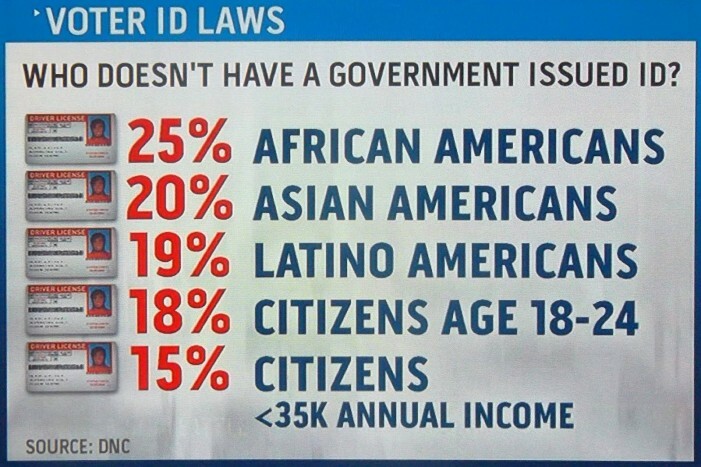 Voter Suppression Laws Are Working. The real purpose of so-called Voter ID laws is not to prevent voter fraud. That’s how they sell it, but the real aim is to keep poor people, the elderly, and other marginalized people from voting. Voter fraud is a for all intents and purposes a myth: There have been just four documented cases of voter fraud in the 2016 election – three of them voted for Trump. The number of fraudulent votes cast are always such a tiny fraction of the total that they don’t effect the outcome of races. And we’ve known this for a while. Seriously, during part of the George W. Bush administration, U.S. Attorneys were ordered to make finding voter fraud a higher priority than any other case they were investigating. And after a lot of time and effort was expended, they came back and told the administration what state officials who run elections have been saying for decades: voter fraud is virtually non-existent. The most common forms of voter fraud, which add up to far less than one percent of the votes cast, are relatives of recently deceased people casting an absentee ballot for the dearly departed. The next most common is a relative who has been appointed a legal guardian of an elderly relative believing (incorrectly) that the power of attorney they have been given over the relative with a diminished capacity gives them the legal right to fill out the relative’s ballot. And the third most common are people who are wealthy enough to own homes in multiple states registering in all of them and voting there under the mistaken notion that because they pay taxes in more than one place, they can vote. The Republican party of my state several years ago famously spent more than a million dollars tracking down four voters who had voted illegally in the very tight governor’s race that year: all four of the convicted felons who hadn’t had their voting rights restored had voted for the Republican (because the Democratic governor had been the state’s Attorney General before, and the four felons held grudges against her). A lot of people ask, “What’s so hard about showing your ID?” Which seems like a reasonable question to a person who enjoys a certain amount of privilege. The funny part is, that the people asking this know how hard it can be and you can prove it to them. All you have to do, is ask them whether they look forward to going to the DMV to renew their driver’s license. They will either brag about how wonderful it is now that their state allows people to renew on line, or they will tell you a horror story about being trapped at said office for a long period of time. While it is an inconvenience to someone who is able-bodied, has access to their own transportation, and has a work schedule that allows them to take the time to go stand in line, to anyone who isn’t in that situation, it becomes an insurmountable obstacle. Most poor people in the U.S. work multiple jobs. They aren’t hanging around on street corners waiting for a welfare check (that’s an even bigger myth). The typical low income family has trouble finding the time to sleep and cook meals for their kids, let alone try to find enough time during one of the days a licensing office is open to go stand in line for hours. That’s if they can even get to the office. The states that have passed strict Voter ID laws also happen to be states that have fewer offices where people can get an ID. And coincidentally, they tend to only have those offices in locations convenient to affluent neighborhoods. So you have to add many miles of travel (and the time and expense involved) to the difficulties to overcome to get an ID. That’s if the person has their own transportation. And it just so happens that the same states the have strict Voter ID laws also spend the least amount of money on public transit. Yet more barriers. I think about the hassle my mom went through a few years ago after a move when she was trying to get her license renewed and updated with her new address. I don’t remember how many times she had to go back, but it was several. One time it was because whoever she talked to before she went in didn’t tell her the right documents she would need to prove what her new address was. I don’t remember what the problem was the next time, but then after she finally got it after her third or fourth visit, they mailed it to her and several pieces of information on it were incorrect. So she had to go back to get it corrected, and that took more than one trip. My mom is retired, so she theoretically had the time, and she can drive herself, and the office wasn’t very far from her apartment, but she’s got a lot of health issues, and some days she just doesn’t have the stamina to sit in a non-ergonomic waiting room chair for who knows how long, right? And then there’s the matter of the fee to get the ID. The constitution forbids poll taxes but the requirement of having state provided ID for which you are required to pay a fee is essentially a poll tax. And even if you argue that the ID serves other purposes, the fee is yet another barrier for low income and fixed-income people. So, Voter ID laws effectively take the vote away from low income people, people with disabilities or mobility issues, and people living in certain communities. And the lawmakers who pass the laws are well aware that those populations tend to vote in favor of one party more often than the other. They want to take that vote away. Fortunately, there is something you can do about it: Donate to and/or Volunteer with Spread The Vote (spreadthevote.org). Spread The Vote helps people get their required ID. They provide volunteers to help people collect the required documents, transportation to the apply for their ID, assistance with fees, and so forth. If you want to help with the fight at a legislative and legal level, consider donating to Project Vote (projectvote.org). Project Vote is working to improve voter registration processes and remove the barriers to make it difficult for people to get registered and to vote.